Yet another foggy day, alas! We’ve exhausted most of the local treasures so now we have to go on long road or ferry trips to get to the few remaining ‘must see’ locations (like the island of puffins: Mykines!) There are a couple of pretty places that are close-by but to appreciate them the fog has to lift and the sun has to shine! It shows no sign of doing either until Friday — but considering the most exciting thing about the Faroe Islands is the weather, plans could change at any time. Plans have been put into motion for a ‘proper Faroese meal’ at a restaurant that still has stocks of puffin and blubber. I’m still unsure if I’ll give the wind-dried fish and sheep a go. They keep saying that it’s really nice. But they say it with a grin on their face. Two photos again — one lovely, the other a little dull (I’m not sure if I like it or not). This one’s rather plain but at the same time… interesting! It’s actually a sunset! Just about. Because the sun sets in the north west here (due to the angle of the Earth? 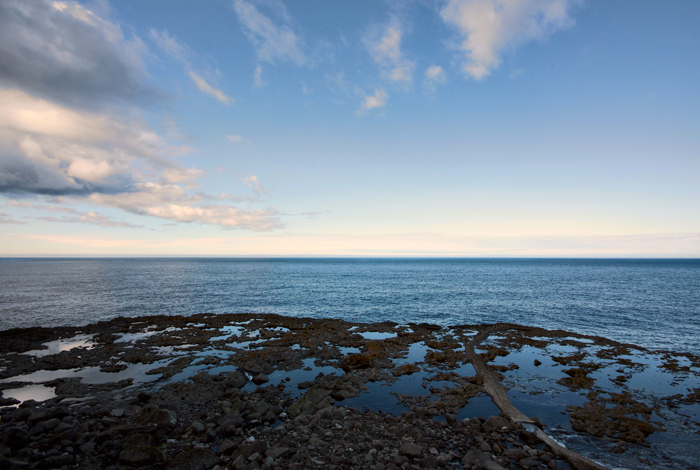 ), and the mountainous terrain, there are very few places in the Faroes that you can actually see a sunset. Leirvik is one of them, but it’s still very rare that it sets properly. In this photo the sun’s occluded by the band of cloud at the horizon. Because the sun is very ‘small’ up here in the north there just isn’t much sunset to enjoy. 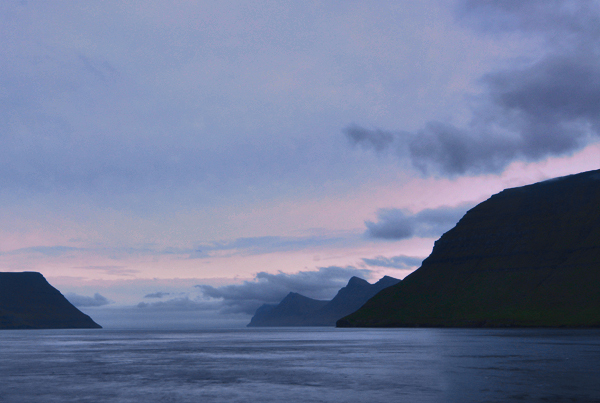 Anyway, there’s your first (and probably last) sunset photo from the Faroe Islands! It’s not that bad actually. I think my tired eyes are unable to appreciate it! Busy busy busy… boats boats boats Meet my host, the flexible gymnast that can perform 'tricks'… More live music photos and a sunrise! And… the sun is out! That second photo is nice, I told you. It is actually better larger. But then I am all about the subtle colour. And I demand, by way of someone who is living vicariously through you… that you try at least one “wind dried” article. I would go for the dried fish rather than the meat, dear…. god knows what ghastly organisms and bacteria have been living in the meat for a year…. I’ve seen some wind-dried fish and it looks pretty… dessicated! But still kind of the original colour. Isn’t Parma ham/prosciutto similar? And I’ve eaten lots of that before… And still here to tell the tale! The second one is VERY pretty but I dislike the featureless water (it’s a long exposure so it goes all ‘glassy’). I prefer angry waters, like those of the Bosphorus. I guess it’s very easy on the eye though… and everyone likes a sunset photo, eh?! Maybe you should have taken a stock of jaffa cakes or something with you XD To tide you over when the food looks inedible. Just like what you said in my facebook, I would like to see the pictures of cute Faroe girls that wont leap at you. Come on, come on. Both pictures are absolutely lovely, Sebby. My other host has just turned up with a BOX of something weird. I’ll see what I can do, Andhari!